During my visit to Berlin a few months ago, I stayed in a modest boarding house at the fringes of the Prenzlauer Berg district. I found it hard to believe this quiet neighborhood of unpaved sidewalks (but with high-speed Internet connection) is only a short bus ride away from bustling Alexanderplatz. Next door was an allotment garden. I relished at the sight of the neat flowerbeds with garden gnomes and impeccable lawns on the small lots. Living in rural America, I had forgotten all about this phenomenon of the German urban landscape. Allotment gardening in Germany started more than 100 years ago. For a modest fee, workers could lease a lot to grow vegetables and breathe fresh air away from their crammed living quarters. By the mid-19th century, most German cities had allotment gardens, although not all of them were for the urban poor. The idea of gardening for recreation goes back to the Schrebergarten movement. Its initial idea was to provide an outdoor space where children could play and exercise. Then the parents wanted in, too, and by the end of the century, the Schrebergarten movement had its own associations all over the country. The Schrebergarten’s namesake, the physician Moritz Schreber from Leipzig, was actually not the founder of the Schrebergarten; he had studied the effect of urban life on the youth and propagated outdoor physical activities and the gardens were therefore named in his honor. During the two World Wars, the allotment gardens and Schrebergärten were important sources of food, fulfilling a role similar to the Victory Gardens in the US, the UK and Canada. When German cities lay in ruins after 1945, the garden huts on the lots were often turned into small homes without a building permit. The authorities tacitly granted those residents occupancy for life. The neatness of the lots in an allotment garden is no coincidence. There are strict rules as to what you can do and grow, and no lot may be larger than 400 square meters. Because the lots are viewed as a communal space that passers-by should be allowed to peak into and enjoy, the hedges and fences must not be taller than 1.25 meters. It is not allowed to plant trees that grow taller than 2.5 meters because they would cast shade onto your neighbor’s. A minimum of one-third of the lot must be designated to growing fruits and vegetables. Growing up in Frankfurt, my family also had a garden, about 30 minutes walking distance from our apartment. It was a large stand-alone Schrebergarten thus my father was free to grow what he pleased. And he surely did. The garden came with several large fruit trees and berry bushes, to which he added rows and rows of vegetables and a large strawberry patch. The garden was hugely productive yet anything but neat, and the garden hut was a constant construction site. How I envied the kids in the surrounding gardens with manicured lawns, mulched flowerbeds, and matching deckchair cushions and tablecloths! Looking back today, however, I consider myself fortunate that our garden was the way it was, a messy Garden of Eden. Because otherwise I might not have learned how to distinguish a red currant bush from a black currant one, and how white asparagus is grown. To use up some of the seemingly never-ending supply of cucumbers from my garden, I made Cucumber Stew (Schmorgurken) from Spoonfuls of Germany today. 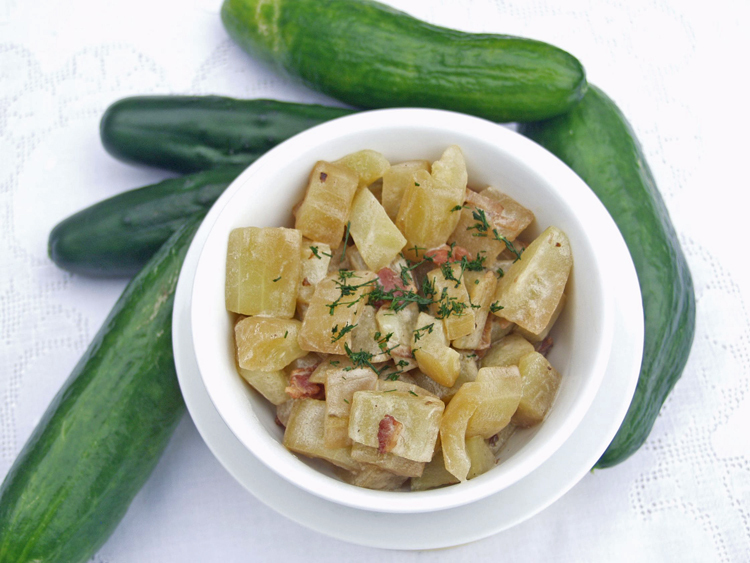 It is a typical dish from Berlin that must have been invented when allotment gardeners were getting tired of cucumber salad, and had no more room for jars of pickles in their pantry. Small garden or large, Germany or overseas, when it comes to cucumber glut, all gardeners have the same lot. Categories: Uncategorized | Tags: allotment gardening, berlin, cookbooks, cooking, food, gardening, german cookbook, german food, German history, germany, recipes | Permalink. Thanks, Nana, pleased to hear that. There is so much to discover about Germany through food and cooking. Indeed, I have never seen Schmorgurken outside of Berlin and the Brandenburg area. Richensa, glad you can confirm from the source what I wrote. Sadly our cucumbers are done for the season. Did your father grow swartzenberren blackberries? We brought seeds with us from my husband’s family garden in the midwest. They are somewhat smaller than blueberries but prolific and I freeze them for winter baking. Judy, interesting you are mentioning Schwarzbeeren, which is another German name for bilberries, whortleberries, or European blueberries. My father did not grow them in the garden, I guess not enough moisture and not sufficiently acidic soil. But in my book, I mention that those are used in Germany, my favorite dish when them is a chilled sweet soup. Here in the US I use regular blueberries instead. Its sounds like you are in the envious position of having lots of them! Schmorgurken are not exactly mainstream German cooking. – Glad too that you found my blog, and that you keep up German cooking and your kids enjoy the potato salad!